Why would a happily married Florida housewife pick up her husband’s .22 caliber Colt Woodsman semi-automatic pistol and use it to kill her two young children and herself? Cynical newspaper reporter Richard Hudson is assigned to find out—and the assignment will send him down a road of self-discovery in this incisive, no-holds-barred portrait of American marriage in the Mad Men era. 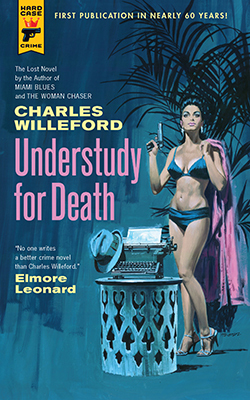 On the 30th anniversary of the death of the masterful novelist the Atlantic Monthly called the "father of Miami crime fiction," Hard Case Crime is proud to present Charles Willeford’s legendary lost novel, unavailable since its original publication by a disreputable paperback house in 1961. One of Willeford’s rarest titles (copies of the original edition sell for hundreds of dollars), Understudy for Death still has the power to disturb, half a century after its debut. First publication in almost 60 years! "No one writes a better crime novel than Charles Willeford." "Extraordinarily winning...Pure pleasure...Mr. Willeford never puts a foot wrong." "If you are looking for a master’s insight into the humid decadence of South Florida and its polyglot tribes, nobody does that as well as Mr. Willeford."